Where is Kaw Kaw Lay Liew? Wanna wish her a very Happy Birthday. It's her Birthday today. What a wonderful thing! Our Birthday is like Do~Re~Me~ . Papa's on 22nd, Mine on 23rd and Kaw Kaw's is on 24th. Anyone 25th? 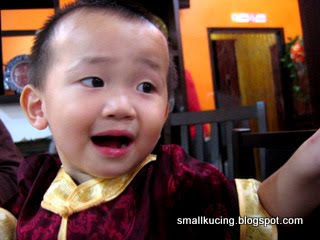 Back to some CNY Cari Makan. 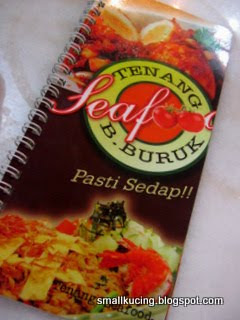 The 1st day of CNY we had a nice dinner at Tenang Seafood Restaurant located along Pantai Baru Buruk. Saw many people "makan-ing" there. It's a relatively new restaurant. According to the owner, they just open two months ago. Very nice interior decoration. There are glass wall with water that makes the place cooler. Tastefully decorated. Now let's see if the food is as good as the decoration. Let's order. Two watermelon and one pineapple juice. 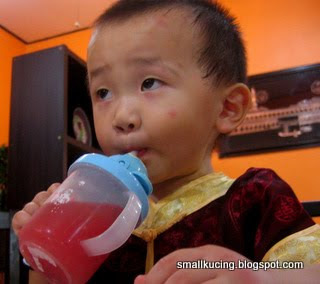 I had watermelon juice with mamarazzi. Aiyak..Papa already told them don't add sugar and yet they added. Thank goodness it's not that sweet. Alo BOSS! 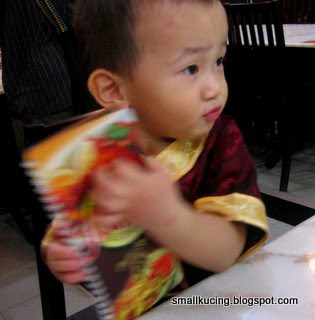 How come the next table got their food first padahal we came and ordered first? Double standard ah? Sorry no cure. I want my food now. Hungry. Puyuh Goreng. Hmmm..the meat was very tender and well marinated. Papa said it's a bit salty. 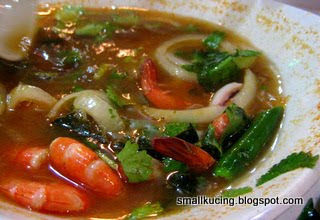 Tomyam Seafood. Hot hot hot. Mamarazzi liked the way that they did not shred the Lime Leaves. They put the whole leaf into the soup. Easier to eat. 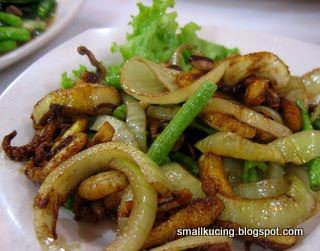 Sotong Goreng Kunyit. Very "bouncy" sotong. Nice. Again Papa said a bit too salty. Salted Fish Kai Lan. Not over cooked. Confirmed there is no pesticide in this Kai Lan coz Papa found a tiny worm sticking on one of the leaf. Hentam la..big worm eat small worm. In Thailand people not only eat worms but also bugs. Nasi Goreng Ikan Masin. Not bad. 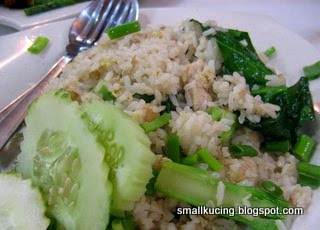 Found a lot of salted fish in the rice. Maybe that's why Papa kept saying the dishes here salty. 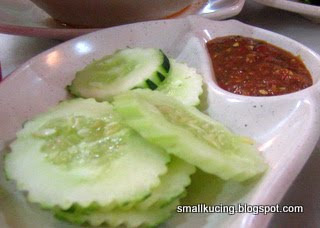 The Sambal Belacan to go with the Nasi. Yumm..yummm...really berasap. BOSS!! 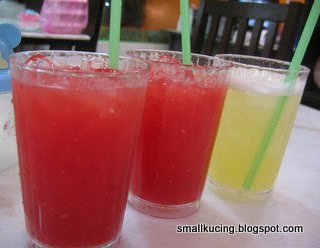 One more Watermelon Juice and fill it up with Ice please. Smoke is coming out from my ears. Total damage? Less than RM50. Forgot the exact price. Mamarazzi said it's better than Pasta. Wah....the tomyam seafood looks apetizing! I love hot and spicy food! Makes my mouth water already! Sure better than pasta....gimme lots of spicy food anytime! 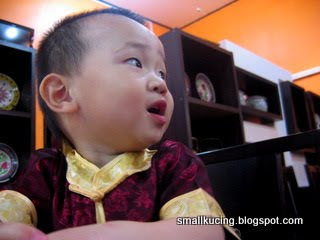 Oh..i duno puyoh also can be eaten...hhehee..i m one Paliah ah sou. It along Pantai Batu Buruk at K.T. Can't give you the address coz I forgot where I stuffed the receipt. Have to dig for it.Will let u know later if I find it. 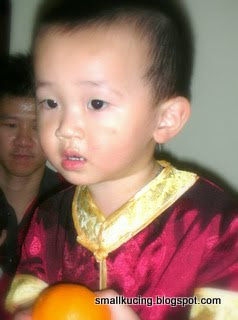 Happy Birth day Kaw Kaw! I like tomyam and spicy food. 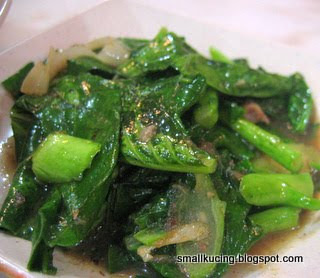 Wow... this one of go wif kerabu mangga, very nice leh! look at his lips!!! so merah dy! hahahahahah.. ethan kenot eat spicy food one..
Joshua also kenot tahan eat spicy food.